Hey guys! I'm back. And trying to grasp the fact that a great vacation has indeed come to an end. But I must say I'm settling just fine. 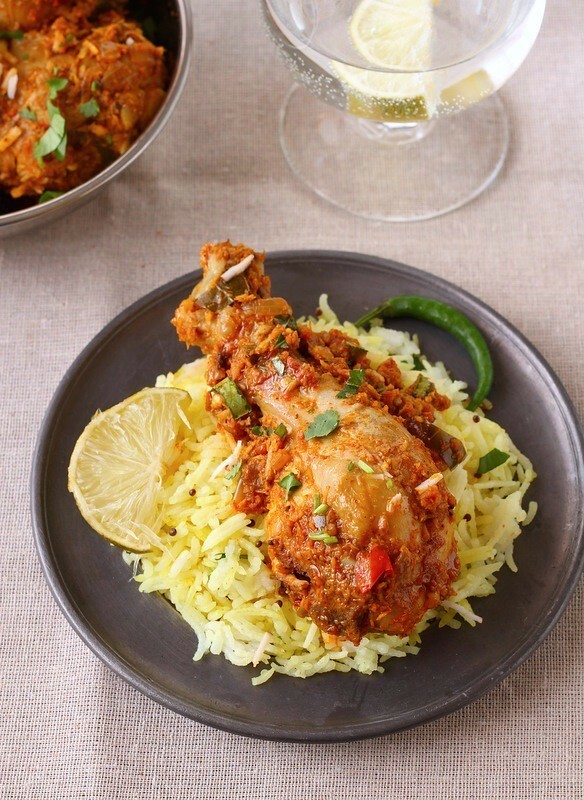 Lots of work to get in order before I'm back to blogging so I invited my friend Tanvi from Sinfully Spicy to share a delicious and spicy chicken recipe with us today. Tanvi already said all I wanted to say below. She has been a dear friend from the time I started blogging and I'm so thankful she accepted to do the post despite being busy. Me & Kulsum always joke & tell each other that we are long-lost sisters, sisters who have never met or knew each other before our food blogs happened. We took off around a similar time frame in the blogging world and have been in touch for almost 2 years now. Sharing an unadulterated love for all things Indian - food, spices, culture & lifestyle, whenever we communicate via twitter or mails or comments, mostly, we end up saying "oh..I was thinking the same way too" :)..It’s like you read my mind & speak my heart! These are the reasons I adore blogging. You touch people & they form a beautiful part of your life. It's a pleasure to share my little bit on Kulsum's blog today. Thanks for having me here. While we were discussing the recipe for the guest post, she suggested doing something south indian. I mostly cook north indian food at home but am a die-hard fan of south indian food..It was a rare opportunity to make one of the south indian specialties which both me & my husband like to cook in our home kitchen. So here I am with a recipe for Chettinad Chicken, which I learnt way back in Chennai when my husband was studying there. Every time I cook it, we enjoy it thoroughly. Hope you like it too! Chettinad is a region in southern india known for its rich cultural heritage, art & architecture but mostly culinary delicacies. In fact, the cuisine from Chettinad region is what made it so popular on the world food map. The cuisine is not for the faint hearted - its fiery, pungent & aromatic thanks to loads of spices & chilies that make their way into the preparations. There can be something very addictive about spices if you get a hang of them, this is exactly what chettinad cuisine offers - a soul satisfying experience replete with fresh ground exotic indian spices and tropical touch from predominant use of coconut & curry leaves. 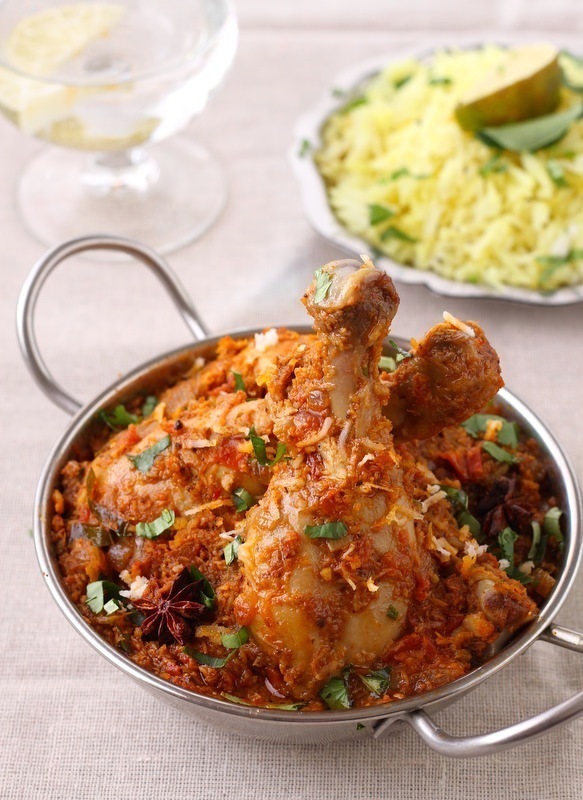 Chettinad Chicken, one of the most popular dishes is a dry (ish) chicken dish prepared by slow cooking the chicken in a concoction of freshly ground, fiery masala (spice paste) in its own juices. 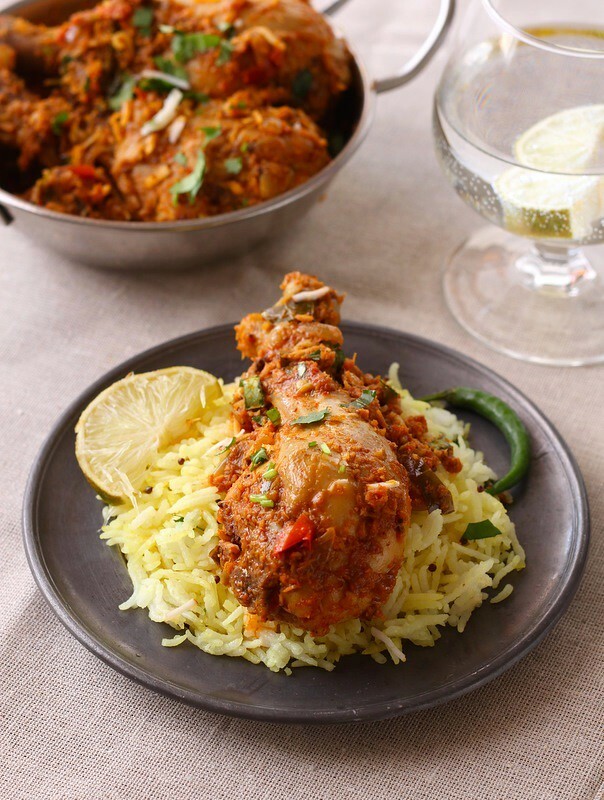 The spice paste redolent with fresh grated coconut, star anise, green cardamom, fennel & cloves is heart warming and slow cooking infuses the chicken with flavors while cooking, giving you divine taste in each bite. There are some dishes that are therapeutic to senses as you cook; it is one of those chicken recipes that is bound to hit the right note if you enjoy spicy food. Having said that, if you want, you can reduce the amount of chilies to suit your palate. The dish pairs best with flavored rice like lemon or tomato rice. The same recipe can be used with seafood, lamb or mutton. And I cant stop myself from saying this - eat with fingers. the traditional way. 1. Sambhar Onions can be substituted with shallots or equivalent quantity of chopped red onions. 2. Fresh coconut can be substituted with unsweetened grated coconut. · In a medium saucepan, first dry toast all the spices except fresh coconut for 2 minutes on low heat till you smell the aroma. · Next, add the grated coconut to the pan and toast till the coconut starts to change color lightly and drying out. About 8-10 minutes. · Once done, remove pan from heat & allow cooling. Grind the cooled spices & coconut to a paste using 1/4 cup of water or as required for grinding. The paste doesn't have to be silky smooth. Set aside. · In a heavy bottomed pot, heat the oil on medium till it starts to smoke lightly. Add, chopped onions and cook with regular stirring till they are translucent but not browned. About 5-7 minutes. · Next, add the cinnamon stick & star anise and cook for 18-20 seconds till you smell the aroma of whole spices. · Add in the grated ginger and garlic, curry leaves & ground spice paste and red chili & turmeric powder. Cook for 2 minutes. · Next, reduce heat to low, add the chopped tomatoes, mix in & cook uncovered for at least 12-15 minutes with regular stirring till oil starts separating on sides of the pot. · Uncover the pot, check if the chicken pieces are tender else cook for another 2-3 minutes. Once chicken pieces are cooked, turn off the heat, add the lemon juice to liking, cover & let sit covered till ready to serve. 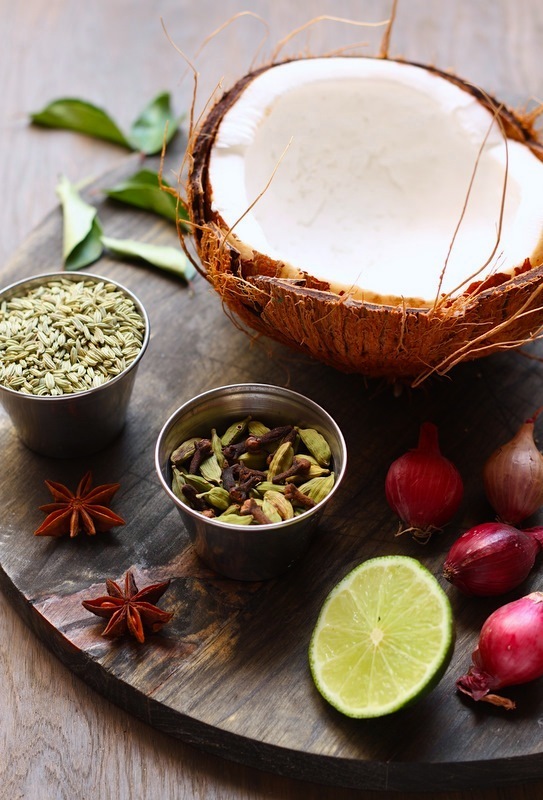 · When ready to serve, garnish with chopped cilantro/ curry leaves/fresh coconut. Serve with warm rice. I LOOOOOVE the photo with coconut and spices!! It's just perfectly balanced! Glad u are doing great my girl! :) And I am so happy to see this guest post from Tanvi! I order this in restaurants ALL the time. So lovely to see Tanvi here on Journey Kitchen. You two do sound like long lost sisters! Lost in an Indian mela perhaps?! The way you cook this chicken is right up my Indian other half's alley. Bookmarked to try ASAP. And Tanvi, you said it, eating with your hands is a must! I don't even understand what I'm looking at....I'm SO IN LOVE. My eyes need a moment to rest. That is such a stunning dish! Really droolworthy. And the pictures are gorgeous. Yup, that's what I love about food blogging great friends come into your life. :-) Lovely seeing Tanvi here! So u back ... share some pictures soon! This chicken dish is making me drool here .. Tanvi did a fantastic job! Thanks so much Kulsum for having me here. And thanks a lot everyone for liking the dish. great guest post. The chicken looks amazing- actually sinful! I love the story of your friendship. I think that is the best part about blogging. The chicken looks so flavorful and delicious. Wonderful guest post Tanvi!! Stunning dish and photos! You had me at coconut :) and infused with all the other flavors - it must be amazing! Congrats on the Top 9! Oh goodness...this looks SO good. What a beautiful and flavorful dish. Tanvi, Tomorrow is Friday and I am tempting to make it tomorrow. Bookmarked it. Thanks for sharing. Kulsum & Tanvi, How beautiful that you too feel like long lost sisters... Blogging is bliss isn't it? Heart you two.. It is so interesting to see how we absorb the culinary influences from the places we travel or live in...Never knew you lived in chennai! Welcome back Kulsum! Tanvi, your guest post is amazing! I don't (can't) eat spicy food and this looks a bit spicy to me, but still I am drooling over these chicken. I'd be drinking lots of water but I still want to eat this over rice... so good! I am not familiar with the different cuisines of India (south vs north etc) so it's interesting how you cook differently even using similar spices. 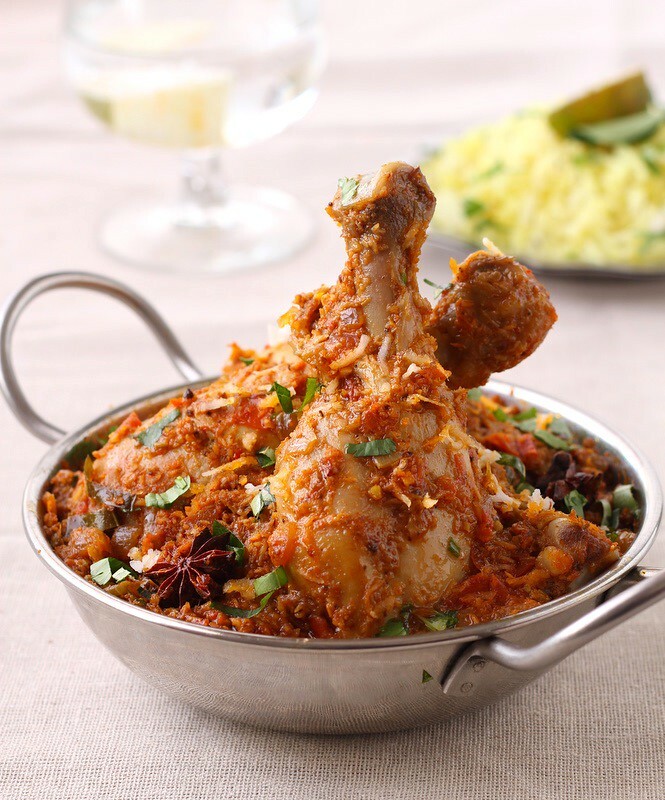 So this is what a Chettinad Chicken looks like! I just got really hungry just by looking at these pictures. It looks delicious! This was great...! Made this yesterday for lunch and we loved it..thank you so much Kulsum and Tanvi.. I've made this many times, and it's fantastic! Udaipur Trip - Food and more!